Dominicana VALS segments adults in the Dominican Republic into one of eight consumer groups on the basis of primary motivations: Ideas, Achievement, and Stimulation. To learn more about Dominicana VALS and its use, contact Jacobo Riquelme at Mercom Venezuela (). 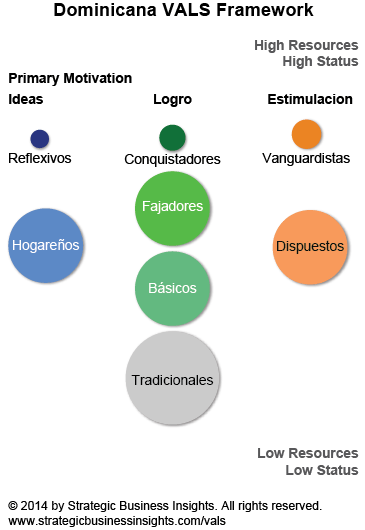 Reflexivos are predominantly knowledge-oriented and reflective. They exercise power and leadership in society through intellectual pursuits. Hogareños are sociable and open to learning, but the center of their universe is home. Conquistadores are natural leaders who enjoy physical and intellectual challenges; they reach beyond tradition through an appreciation of modern life. Fajadores are planners—they focus on goals and objectives. Básicos prefer stability over change and to follow decisions of others rather than leading. Vanguardistas want to change the world. They want to be the center of attention through their style of dress and opinion leadership. Disputestos pursue fun and entertainment through social events and generally focus on excitement in many of their daily activities. Tradicionales show little ambition or interest in novelty and instead prefer a simple, traditional life. Their motivation seems to be homostasis (energy balance and quietness).